Time for yet another The Macallan, this time a limited edition. Recently I reviewed The Macallan Edition No. 1, and found it to be very good indeed. In fact, it was the best The Macallan I’ve tried in ages. So what about the follow up? 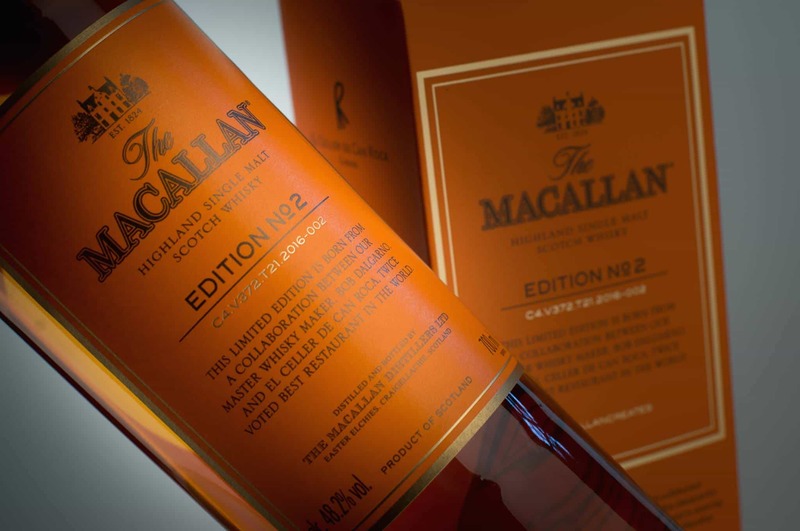 The Macallan Edition range is another slick marketing series where, in the absence of details about the age, we need some hook to seize interest in a cluttered marketplace. Fair enough (though perhaps calling this limited edition ‘Edition’ is a little unimaginative). 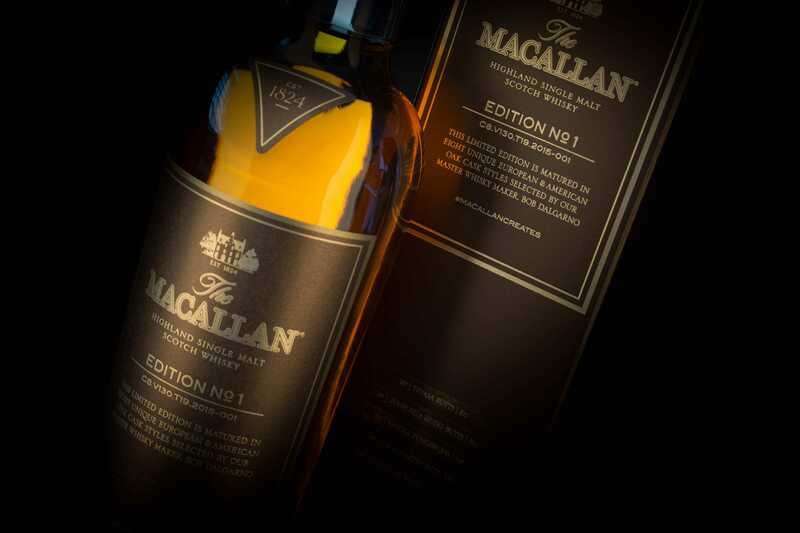 The Edition series is all about collaboration with partners, though I don’t believe The Macallan Edition No. 1 one was created in collaboration? Anyway, part two has been created as a partnership between Bob Dalgarno, Whisky Maker at The Macallan, and the Roca brothers of restaurant, El Celler de Can Roca, in Catalonia. Fine restaurant, I’m sure. People with taste. People who know a thing or two about flavours. On the nose: tiramisu! Lovely mixture of sweet fresh mascarpone cheese, milk chocolate and muscovado sugar, with a drizzle of espresso. A little later: dried apricots, fresh berries – blackberries, raspberries. Golden syrup. Raisins. Maybe even lemon drizzle cake. Divine! In the mouth: all of the above. Coffee-led woody notes that continually bring warming spices of cinnamon. Figs, prunes, and a touch of apricot. Then pears with a dusting of that muscovado once again. Slight tannic quality to balance out the heavy sweet flavours. Ginger. Faint fennel note. A little burnt wholemeal toast with a layer of strawberry jam. Blood oranges on a woody finish. Excellent! The Macallan swaggers across the nearby hills into heavier Glenfarclas territory, bold as brass. Excellent stuff indeed and – for a The Macallan – superb value. Guess what? Better than Edition No. 1. This is one of my top whiskies of the year. This annoys me largely as most whisky geeks, myself included, occasionally bang on about age statements being important. 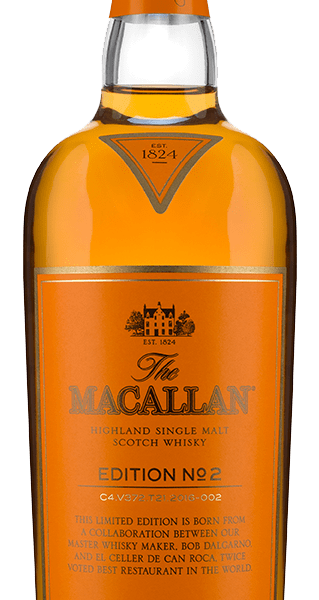 The Macallan brings back the age statement for a recent new whisky, the Double Cask 12 Years Old, and the whisky world rejoices at the number. Yet the whisky was fine, lovely on the nose, but as mildly dull to sip as listening to a speech by Theresa May. For the Edition series they still don’t have an age statement. And you know what? The Edition whiskies are better by a country mile. Isn’t that frustrating? To say that age does matter, except that it doesn’t? How cruel of them. I’d buy four of these and it still wouldn’t be enough. Well done Roca brothers. Roll on No. 3. On the nose: initially is a sweet mix of rolled tobacco and cinnamon that rises out of the glass. This moves into orange peel, dried fruits, milk chocolate and a fig roll. Water delivers a floral note and revives the citrus appeal. In the mouth: lighter than the nose suggested, more delicate and yet confident. The lasting finish is that of chocolate orange with a touch of dryness. Cinnamon bark, vanilla essence, brandy snaps and a touch of rubber before that finish kicks in. You have to return for more as deep down you know within the walls of Moria treasures await. Chinese 5-spice, cloves, a little toffee and maple syrup combine with cardamom and green pepper to give this whisky some luxurious body. On the palate I felt this one was better without water, even just a small amount really sands it down to a disappointing experience. Without water, you have a cleverly engineered Macallan that for the money is a worthwhile purchase, particularly when assessing other brand releases. This one ticks the value box for what you receive, although I preferred the Edition 1. I believe the thruth is somewhere in the middle. It’s not fair to say NAS equals bad whisky, but I don’t think you should say age doesn’t matter simply because you’ve found a good example where indeed it doesn’t. Some NAS whiskies (haven’t tried this one) are well put together, and I understand they included some younger casks so they don’t want to state the age, but others are just a way of getting out mediocre casks. Transparency is key, I think, and in a way the Edition n°2 provides more details (pretty much everything except the age) than the 12yo Double Cask. No indeed – and to be fair, I was being facetious in pitching it as a binary decision, teasing the debate which is both serious and pointless at the same time. (And it was more of a partner piece of the review of the 12yo Double Cask, last week, which welcomed the age statement but the whisky was average. So teasing in order to let people reach their own conclusions! I am a newbie when it comes to Scotch, but so far I have learned I favor the Sherried variety. I tried this bottle recently and must say it resonated with me as it did for you Mark. I have bought several bottles – so cruel it is only to be one batch. Well, I suppose I’ll have to find something similar in the future. I just bought this as a gift for my brother-in-law. Since he is a scotch connisour I do hope this will prove to be special! Hi Della – lucky brother-in-law! I’m sure he’ll love it. Just received a bottle, as an early Christmas present, from a customer who knows I’m partial to scotch. Seriously impressive stuff. Merry Christmas to me. Hi Troutbum – well, Merry Christmas indeed. Nice one. Enjoy! Hi Lukas. Yes, I’d definitely go for No. 2 over Sienna any day. It’s a different whisky, but with much more intensity of flavour. How much is the No. 2 where you are? Hi Lukas. Well, I see your point. If you can afford it, then I’d go for it. I’ve bought two bottles of the stuff I like it that much. But if you think it’ll break the bank then maybe go for what you can afford. I don’t want you to go without food for the month! After seeing a lot of positive reviews for this, I’m tempted to buy it although I really hate buying NAS whiskies since I feel like it encourages the habit. The way I see it if they put an age statement on this (lets say its 10) and a less informed customer sees this 10 year age stated whisky for $100 next to the standard 12 year old Macallan for $50, they’ll ask themselves why they should pay double for a “younger” whisky. I wish they would just put an age statement in tiny print on the back or something. That way they can use their marketing tricks on less informed customers looking at the front of the packaging and appease the whisky purists like myself too. The Glenfarclas 105’s (pre 2014 versions) available at my local retailer have a similar thing where they state that its 10 years old on the back description. I’m guessing that prevents consumers being confused and comparing the $100 105 with the standard $40 Glenfarclas 10.